With the Gannon Cup crew concentrating on their preparations for next week’s Colours Boat Races, UCD’s next two Eights stepped up a category to test themselves at Erne Head of the River. The Intermediate and Club 1 crews were fastest in their categories but the Senior boat collided with a safety launch. 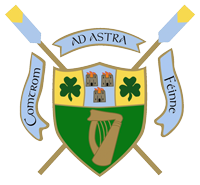 With the Gannon Cup 8+ concentrating on their Colours preparation, UCD’s Intermediate 8+ lead our representation at Erne of the River on 5th March.